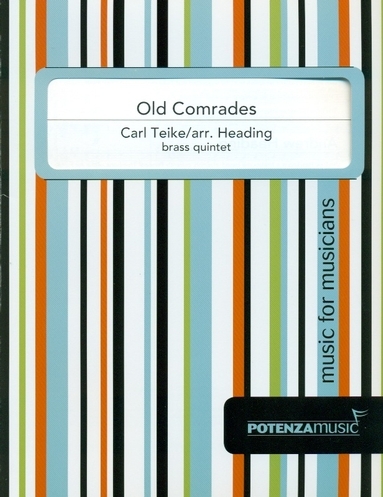 German composer Carl Teike was a military musician who played the horn, among other instruments. He composed Alte Kameraden (Old Comrades) in 1889. Since then it has become the most popular of all his over one hundred marches. This brass quintet arrangement captures the joyful essence of the original and features the horn in the trio as a tribute to the composer. The rhythmic and technical material in the arrangement is quite simple, with the most complex demands occurring in the trumpet parts as grace notes and eighth note triplets. The most challenging element may be the key signature, D major. All voices get a chance to play the melody, but standard voicing of the bass line in the tuba part, accompaniment in the middle voices, and melody in the trumpet parts prevails. Considering its overall simple content, this arrangement would be perfect for a high school quintet.